Looking back from today, at the ripe old age of 55, I see clearly that two interwoven themes have dominated and directed my birding life. Firstly a loathing of being indoors during daylight hours and secondly the overwhelming desire to live as free as a bird. In particular the wish to travel south and north as do the migrating birds, making the most of our daylight, reveling in both the sunshine and the rain. However in our world of compromise I cannot be outdoors whenever I wish, and I am not free to move along with my beloved birds, so I seek solace at every opportunity – retreating into my imagination. Into tales about the secret lives of birds and birders then and now. I find that reading the words of others serves to rekindle a spark of wonder, even whilst indoors; the flame which being-outside-in-Nature so easily ignites. And this despite Mach’s principle that the element of wonder never lies in the phenomenon, but always in the person observing. For example: after living in East Africa for nearly six years I can admit at last that I find the african grass warblers, nowadays called Cisticolas, truly wonderful. Admit that I am ready to take-them-on and, no longer in secret, to admit my love for the most difficult of avian genera (difficult in the sense of being hard to identify) that has issued from this old continent – praise be to the Cisticoline Grass Warblers! This is a very african group of birds; only three species of Cisticola have been able to maintain themselves beyond our shores. So in my opinion Cisticolas are indeed great! “Well, I cannot even pronounce Cisticola, let alone try to identify them“. Also one finds whilst on mammal-oriented safaris many guests will refuse to allow the vehicle’s driver to stop for such a dreadful “LBJ”. Again, on walking safaris, it’s amazing how often guests and “big white hunters with guns”, and even our local guides will fail to notice the cisticolas calling and wing-snapping in aerial song-flight right above their heads or duetting from a tussock almost under our noses. It is perhaps unfortunate that the generic name Cisticola was first penned, for one dare say it might be a misnomer, by the German naturalist Johann Jakob Kaup. Certainly not by the young yet widely travelled and, at 25 years of age, already retired, Constantine Samuel Rafinesque, who was born in Constantinople, and quite accurately described, the marshy haunts of the Fan-tailed Warbler when he named it Sylvia juncidis during his stay in Sicily at the beginning of the nineteenth century. It was later, in the middle years of that century, that Kaup appears to have coined the name Cisticola. Yet not one member of the entire family Cisticolidae is a “haunter of the cistus”. 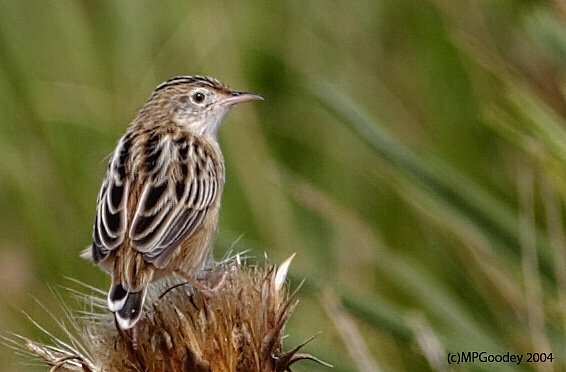 The Fan-tailed Juncidis is the only cisticola species to have braved that peninsula of Asia, which is called Europe, at least in historical times; and this is usually known nowadays as the Zitting Cisticola, although it was still called Fan-tailed Warbler Cisticola juncidis when I was a lad. It seems quite likely that this species was wrongly believed by Kaup to inhabit either maquis or garrigue (both are anthropogenic forms of Mediterranean woody scrubland – scrublands where the rock rose family, or Cistus, is particularly well-represented) rather than the marshy grasslands containing juncus beds that Rafinesque clearly knew it prefers. However of late a theory has emerged that by giving them their generic name, Cisticola, Kaup could have meant that they are inhabitants (-cola) of a basket of woven twigs (Latin: cista-), referring to the finely meshed bottle-shaped nest of the Zitting Cisticola, where the entrance spout faces upwards, and which happens to be that used by the most widespread species. Unfortunately no other Cisticola species builds a nest of the soda-bottle shape quite like this, so it is still not a name representative of the genus as a whole. If you’ve read this far it should be clear that active enjoyment of the African grass warblers, of the genus Cisticola, is an acquired taste. In fact nearly all of my birding customers, especially those first venturing onto sub-Saharan soil, and even some experienced safari guides here in Tanzania, will soon admit to either fearing or despising these brown birds, or both in roughly equal measure. It was entitled A Review of the Genus Cisticola and earned Lynes the Goldman-Salvin award for its contribution to African ornithology. After the publication of this seminal work Hubert Lynes made a further four expeditions to Africa primarily in order to clarify various points for a planned Appendix to that work. However on what became his last expedition, to Darfur in 1938, Lynes contracted shingles which badly affected the sight of one eye so that he returned to Britain in poor health. His health never fully recovered. He died in a military hospital in north Wales on November 10 1942. 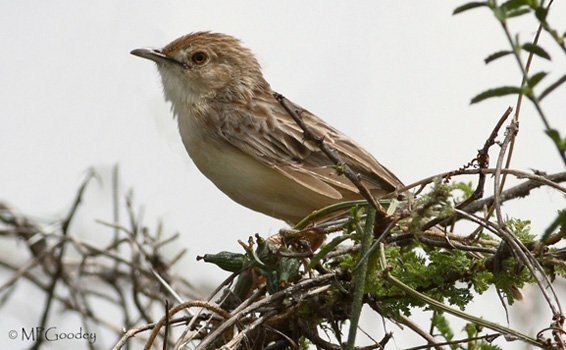 Although the constituents of such an unglamorous and widely distributed genus, often occurring as they do in derived and semi-open habitats rather than in the depths of some awesome forest, have yet to be subjected to rigorous and widespread DNA analysis there are, almost certainly, at least 40 ‘good species’ of Cisticola here in East Africa, that is forty species within the boundaries of Kenya, Uganda, Rwanda, Burundi and Tanzania. And in some terrific ‘LBJ’ places, within an area of say only 20 square kilometres, there could be as many as fifteen different kinds of Cisticola. Yep! These are not soft brown sodas, sickly bottled Colas, we’re talking about here – they’re the Cisticolas, the original and best – the Grass Warblers of Africa. In the late eighties two fantastic birders – let’s acknowledge them: Iain and Richard – once guided a group together across Kenya. Early on a Sunday morning the birders stood in a quiet and respectful line facing the big brown boulders at the stake-out for what was then, and is again, known as the Rock-loving Cisticola. However instead of a bird vocalisation Iain loudly plays the title track from Bruce Springstein’s “Born in the USA”. *Kilombero (Melodious) Cisticola, Cisticola sp.nov. * White-tailed Cisticola, Cisticola sp. nov.
Stunnig birds photos and post. Thanks for that detailed presentation of the cisticolas. Great post, James. Cisticolidae really is a hugely mixed up group now with all those genera included in it. If Wikipedia’s claim that “They are believed to be quite closely related to the swallows and martins, the bulbuls and the white-eyes” is accurate they’re even more mixed up than I’d ever realised. Excellent post James – intriguing family that’s for sure. Thanks to Martin Goodey for pointing this post out to me as well. Let’s go and count shorebirds! Where Are You Birding This Final Weekend of February 2015?